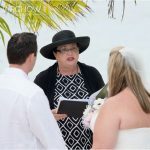 When this couple from Las Vegas, Nevada asked me if I would perform a special wedding ceremony for them, I was delighted to comply. They worked on their ceremony for several weeks, personalising it to suit their heritage, their beliefs and their relationship. 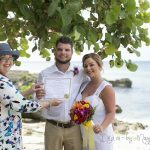 It was a great experience for me as well, as I had never heard of Anam Cara, and using the hand-fasting ceremony in this particular way was new to me too. 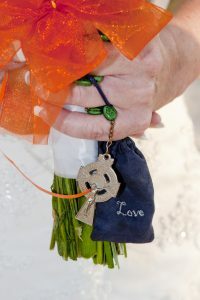 In addition to her bouquet, the bride carried a small blue pouch, given to her by her aunt. It held a small silver angel figurine and a crystal. 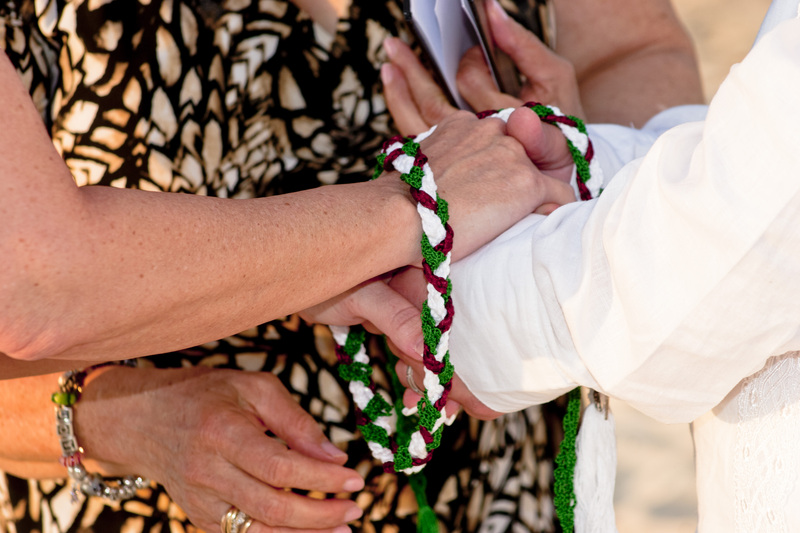 The burgundy ribbon in the hand-fasting ceremony came from the bride's paternal grandmother's sewing kit, her green Irish rosary was given to her by her maternal grandmother. Since both grandmothers have passed on, the bride wanted to honour them, and have them "participate" symbolically in the ceremony, and she chose this way to honour their influence and their presence in her life. The ribbons in a hand-fasting ceremony are significant to the ceremony in that the colours are what the bridal couple choose to bring to the marriage. Each colour represents a characteristic. The braiding of the cords is significant, as in Irish tradition it is thought that any bad luck or bad spirits get "lost" in the weaving or braiding. Braiding then, is supposed to prevent bad luck or spirits from finding you, and therefore many people choose to braid their hand-fasting cords. 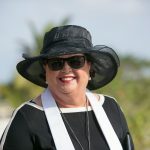 This is what the bride told me about Anam Cara: " Anam Cara was significant to us , as we started out as friends, and I love the tradition of one's soul finding its true match. I thought it was a beautiful thought, and we wanted very much for it to be a part of our ceremony, as we are friends above everything else, and as such, we truly have gotten through many challenges. 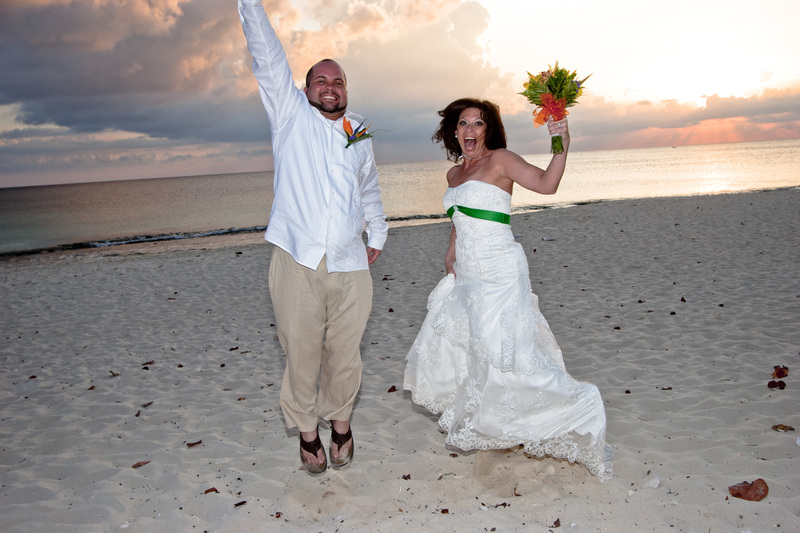 When it came to our ceremony, we didn't want it to be like everyone else. 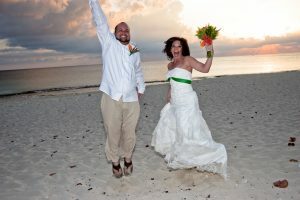 We wanted it to be from the heart, to be meaningful, and to be rich with something that can also be passed down to our family in years to come..."
This is a Caymanian tradition, the wedding jump! 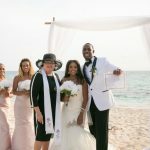 This was one of the most beautiful weddings I ever officiated, and it has definitely made my Top Ten Favourite Weddings. 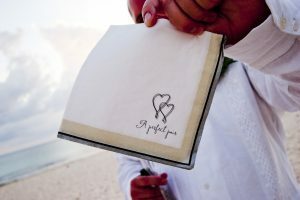 It just shows how special you can make your wedding ceremony when you think about it and personalise it to include features of deep significance and meaning to you. 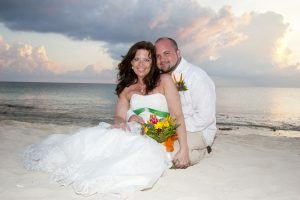 These images by Yvette McField, part of our Cayman Sunset Wedding package. 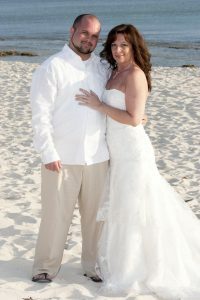 You can book Yvette for any wedding package through Simply Weddings.